In addition to improvements to the Crystal Bridge Tropical Conservatory, the grounds of the Myriad Botanical Gardens received extensive renovations in 2010–2011 as part of the Project 180 plan. These contributions to the gardens area in Oklahoma City have helped it become one of the more popular gathering places in downtown. Visitors and downtown employees alike enjoy strolling along the water, utilizing the dog park, or just lounging around amidst the beautiful landscaping. Similarly, the Great Lawn area is a favorite, a wide open area perfect for tossing a frisbee or listening to a live concert. In 2012, park officials also began offering a summer movie series of screenings under the stars, perfect for kids and adults alike. Sponsored by Oklahoma City-based drive-in SONIC, the Myriad Gardens Summer Movie Nights Series features weekly showings of family-friendly films. Admission is free. Movies are shown on Wednesday nights from late June to early August, and the screenings begin at 9 p.m., just about the time it's beginning to cool off from a hot summer day. The Myriad Gardens and Crystal Bridge Tropical Conservatory are located between Hudson and Robinson, just north of Reno Avenue in downtown Oklahoma City. 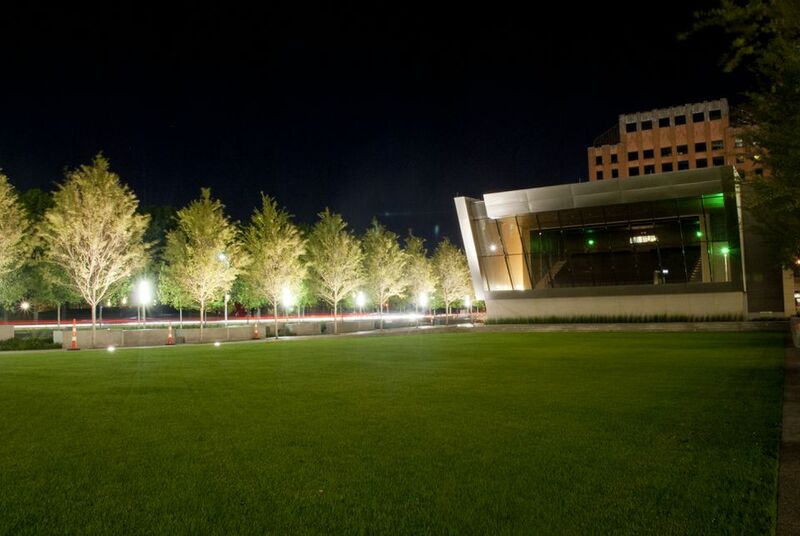 The Great Lawn is on the northern side of the grounds, south of Sheridan in the shadow of the Devon Energy Center. Metered parking is available along the streets around the gardens, and there are several nearby parking garages as well. Make sure you know the details on downtown parking options. Feel free to bring a blanket or chairs and claim your spot on the Myriad Gardens Great Lawn. You can also have a picnic while viewing the movie. However, park officials ask that you not bring any glass. And, of course, be courteous to other movie watchers around you. If you can't watch a movie with snacking on something, or if you know the kids are going to want a treat and a drink to go with their movie, there are a number of local food trucks and other vendors.